A research blog about public legal education (PLE) in Canada. This blog covers the theory and practice of public legal education (PLE) in Canada, spotlighting relevant research and cultivating discussion among PLE providers, thinkers, and others. This is the first of a series of organizational histories that I’ll be posting here throughout the next several months. From November 6–28, I’ll be in Vancouver, BC, to visit the major PLEI projects there: the People’s Law School, the Law Courts Education Society, and the BC Legal Services Society’s legal information department. In preparation for those visits, I’ll be posting brief histories of each organization. Most people point to the People’s Law School in British Columbia as the very first sole-purpose public legal education organization in Canada. In every year since its 1972 founding, the People’s Law School has focused on providing free law classes and plain-language publications to the British Columbian public, offering programs province-wide and in many languages. In its first programming effort, VPLS organized 35 free law classes in Vancouver during the fall of 1972. The classes were wildly successful, drawing nearly 3,500 people. Many of those who came clamored for free publications as well, and soon the project was producing handouts and, by 1974, commercially printing its first plain-language law booklet, Women and the Law. Under the leadership of president-founder Davidson and executive director Patti Pearcey, VPLS grew rapidly during the rest of the 1970s: adding a video production and distribution program in 1973, launching radio and television broadcasts in 1974, offering free law classes province-wide and multilingually in 1975, assembling a long-term funding base (anchored by the Law Foundation of BC) by 1976, syndicating a regular newspaper column by 1977, and beginning schools programming in 1978. In 1981, the organization was serving tens of thousands of people in places all over B.C., and it dropped “Vancouver” from its name to become simply “The People’s Law School” (PLS). The 1981 renaming was just the beginning of major changes for PLS during the 1980s. In 1983, a leadership battle led to the ouster of founder Davidson from the presidency and transformed the organization’s board of directors from a small, managing board to a larger one with strategic representation from the bar and community. At about the same time, a severe recession was hitting B.C. hard and funding cutbacks forced PLS to pare its staff and programming down to their cores. The project again changed its name, this time to the “Public Legal Education Society” in hopes that dropping the socialist connotations of “The People’s Law School” could help attract big funding from the private-sector (the name did not last, it confused people familiar with the organization, and the corporate funders never materialized). As the recession subsided, though, PLS gained back strength on its own, hiring PLS veteran Gordon Hardy as executive director in 1986 and scoring spacious, downtown, $1-a-year office space from the City of Vancouver in 1987. 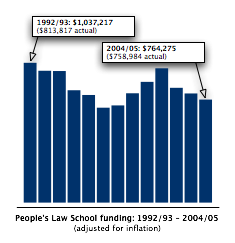 The 1990s are notable for another major recession and the complete program review that PLS undertook as funding cuts set in. 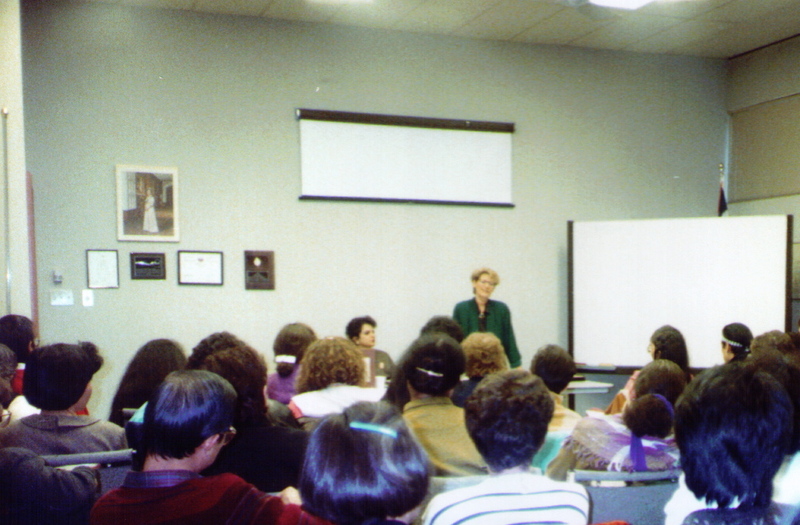 This review prompted an overhaul of PLS’s longest-running program, free law classes, and a shift of the whole organization towards focus on BCers “most in need.” For the English-language free law classes, this meant a sudden drop in attendance as staff learned to deliver PLE to a new audience with a different attitude than the “motivated, educated and articulate people” it had learned to respond to. The revamped programs, including a “Provincial Innovations Program” intended to re-imagine effective PLE delivery for rural communities, have brought the People’s Law School into an era of mature constancy. Today, PLS’s free law class program is still running, now nearly 35 years old and organized as speaker requests from community groups across B.C. The publications program has been running for nearly as long, and last year PLS reached over 90,000 people with free, plain-language publications on the law. Through its Cultural Minorities Program and Provincial Innovations Program, PLS works to ensure it is reaching diverse audiences with its substantive programming. And a Justice Theatre program, originally conceived as just a one-time effort for the Pacific National Exhibition in 1985, has grown to become an extensive schools program, reaching over 58,000 B.C. elementary and secondary school students in 2004–2005. This entry was posted on	October 26, 2006 at 5:41 pm	and is filed under Research Products. Can I still reach you through your blog? I have a question or two to ask you about your entry on the People’s Law School.